Use the left and right arrows to move through the demo. A searchable interactive forum enables members to post any news items that may be of interest to other members. In addition, regular bulletins of upcoming rare track will be posted by the site admin, as well as rare track email alerts being sent out to members (unsubscribe at any time). A comprehensive search location facility is provided with all 2565 stations indexed as well as hundreds of junctions and other major points on the NR network. If a track diagram covering the location is not available, the user is shown an old-style UT listing, else the diagram is displayed. 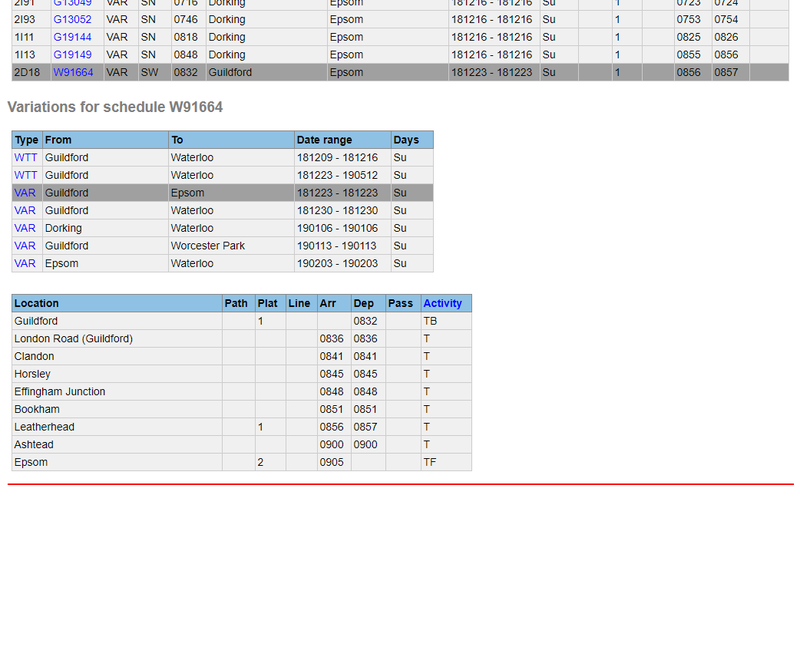 Clicking a piece of track on the diagram enables you to see the schedules of any services that use it. Common track is shown in black, uncommon track is shown in dark grey if there are regular services, or dark blue if there are only irregular services; light blue denotes no current services. There is a facility to record which track has been completed with a simple click of the mouse. When track has been recorded as done, it will be displayed in red and provides a quick check of what is still needed. There is also the ability to record which stations have been 'shacked'. One of many pre-prepared scripts can be run to show what services run over specific pieces of track. Over 2800 crossovers, passenger/goods loops or little-used platforms can be selected by choosing from a list. There is also a facility to designate certain searches as favourites enabling a one-click fast-track process. The results of running a script are presented in the same way as diary entries and/or selecting track from a diagram. Filters enable you to focus on particular services, be they on or around a specific date, from a specific time of day, on specific days of the week, or limiting the display to just regular or ad hoc services. As well as running pre-prepared scripts, the user is able to run ANY query of their own by specifying details on a query form. In the (simple) example shown above, services from Manchester Victoria to Oxford Road - but not reversing at Salford Crescent - are being sought. Again, any ensuing results can be filtered to taste. Pending completion of track diagrams covering the whole of mainland Great Britain, old-style UT pages will be available depicting a 'Quail' page at a time. These pages will give an easy means of marking which track has been done by the user, and will show at a glance which track has UT entries. In order to de-clutter the page listing, there is the option to restrict entries to only those that are required, thus making it easier to see what entries are of most interest. Pages listing all UT entries for a given track diagram are also easily displayed, again with the facility to restrict the listing to items of most interest. Thank you for watching a demo of the new website, which hopefully you have found informative. Close this window/tab to return to the home page from where you can start a free no-obligation 30-day trial, subscribe to the service, or contact me to answer any questions you may have.